This blog is about my journey. A HUGE part of my journey is losing weight and getting myself back to a healthy weight. I want to be more active and set a good example for my kids. Those are huge reasons, but I also want to look and feel good in my clothes. Before I tell you about the effect of summer on my weight loss journey, lets back track a little! I started my Weight Watchers journey in March weighing in at 207.1 pounds. From March 14th through June 19th, I lost 19 pounds! I was happy with this progress. I had a few small gains, but for the most part it was a steady decline each week. Then summer hit. The first weigh in, I gained 1.9 and the second 3.3 pounds. Things got crazy and I just stopped going to weigh in and along with not going to weigh ins, I just stopped tracking or caring what I ate. So it was no big surprise when I went back last week that I had gained another 4.2 pounds. Actually, I was kind of shocked it wasn't more. Then this week, I expected another small gain as the long weekend was a little tough, but it was a large gain... I was up 3.5 pounds. Seriously??!! I gained only 4.2 pounds in the whole month of August, but put on 3.5 pounds in a week?? Say What?? I am blaming the heat, or maybe it was the alcohol I drank this weekend, or the large quantities of pasta salad?? Whatever it was, I am back to 201.7 and ready to roll. I am still down a total of 6.1 pounds from the time I started. I know now that I am back on track, I will have a large loss to start me off which will feel great and keep me motivated. This is my time, I just know that by the time summer hits again, the healthy lifestyle and exercise will be a habit and next summer won't be as hard. I have ZERO excuse now. My kiddos are in school, I have a small part time job, but nothing that keeps me from getting in the exercise and I am ready! I foresee some new clothes as my Christmas presents this year!! What is my plan with all my free time you ask?? Well I am wearing my Fitbit! I plan to walk Monday, Wednesday and Fridays as exercise. Today a friend and I went out for almost an hour long walk...in the hot and humid weather (if that wasn't good for a good 3 pound loss, I don't know what is!!) I will also walk to pick up the kids 4 days per week pending weather. The goal will be to get at least 10,000 steps 5 days/week. I will supplement and/or add in my Beachbody workouts, PIYO and T25! I also just downloaded a workout app which I will let you know what I think of it after I try it tomorrow! Stay tuned! I have a plan for the workouts. Now for the eating. I will have much more time to work on planning and prepping. I am sticking to my simple meal planning because it works and it is easy and let's be honest, I am going to fill my free time up before I know it. I don't want to spend a lot of time planning, I want to save that time for prepping and making sure that I have healthy choices any time I need a meal or a snack! 1. Track everything I put in my mouth. Good or Bad! 2. Stay for the meeting each week at weigh in. 3. Drink more water, I need to follow my own tips! So there you have it. The progress (or lack there of) and the plan! Who else has a Fitbit? Want to be friends? 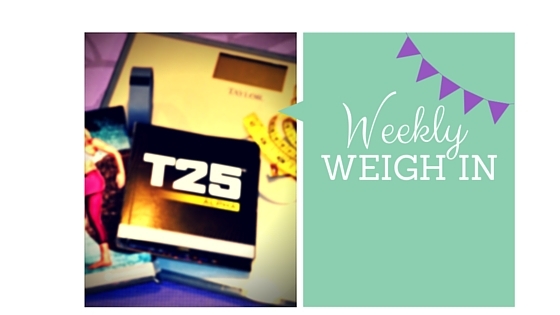 Each week on Thursdays you will find my weigh in results, a look at my week on the Fitbit and an update on how the week went! Hope to see you back here each week! You can do this! Six miles! That's awesome! Good for you! You're an inspiration! Thanks so much for stopping by! I will head over and take a look! 15,000 steps in a day? That's awesome! Stick to your goals and strategies, I'm sure you'll get the results you want! Thanks so much Rachel! I hoping to get another 15,000 step day during this week! It is great! I got the charge and I love all the stuff it can do! Congrats to you! Keep on going, stick to your goals and pat yourself on the back! Thanks Carissa! I definitely was excited last week and was very proud to have stuck to the plan 100% of the time! You did awesome on your Fitbit today! I think I'm the only person in the world without one, but we just joined a gym, so I'll be OK. I've been working hard since May, and I've made great progress. If you ever need support, feel free to reach out to me. Best of luck! Awesome! Thank you so much! Glad to hear it is going well for you! I am excited to go weigh in tomorrow, I think it is going to be great results! I am hoping for new clothes for Christmas too! I'm glad you're not beating yourself up about the weight gain ,stuff happens, but I know you can do this Sandy! Good for you - it is hard to get back on track but I'm so glad you are doing it !!! Keep up the good work. Good luck! I really need to get back in the habit of wearing my fitbit. Thanks for linking up with Best of the Blogosphere! It certainly has been a motivator. I stopped wearing mine for a while, but once I put it back on the challenge started right back up for me! Hey there! Stopping by from the Sunday Blog Hop linky on BecauseImCheap.com Thanks so much for sharing this. I'm working on a weight loss plan and have been thinking of investing in a FitBit. Just because it's easier and more accurate than walking around with my cell phone everywhere. Yes! I definitely recommend it! It is a great motivator too right on your wrist! I had the flex, but now I have the Charge and I love all the stuff it can do! You won't regret the purchase! Good luck!